Background and History arranged by chronological order. Items include: General line, Connoisseur, Supplements, Gift Shop, Special Orders, and QVC. Captions include ware numbers, size, year of production and prices. 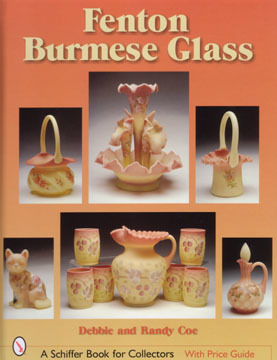 Burmese glass was developed by the Mt. Washington glass company in 1885 and was named by Queen Victoria because the shaded colors reminded her of a sunset in Burma. 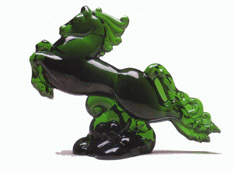 The Fenton Art Glass Company is the only company to successfully replicate the original Burmese formula in modern times. 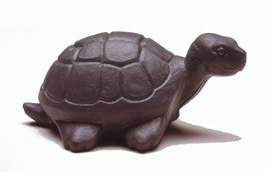 Fenton introduced Burmese in 1970 and continues to produce it. This beautiful book includes 719 color photographs of fine examples from Fenton’s General Catalog, Connoisseur Collection, Supplements, Gift Shop, QVC, and Special Orders. They are organized by the year of their introduction. The major glass workers and decorators are also featured. Each caption has a ware number, size, year of production, and price.